Background: Mycotic aneurysms of Pulmonary artery (PA) are a rare entity, and furthermore it is very rare in pediatrics. Its association with infection, structural cardiac and vascular anomalies, vasculitis, and pulmonary hypertension has been noted. To our knowledge, this is the first reported case of mycotic aneurysms of pulmonary artery in a child with sickle cell disease (SCD). Aim: To report a rare complication of mycotic aneurysms of pulmonary artery in a patient with SCD. Case report: 10-year-old girl, with SCD presented with dental abscess and was treated in her local hospital, she subsequently went on to develop swelling around the neck, with difficulty in breathing and swallowing, she was, therefore brought to our hospital Emergency Room. She had neck ultrasound and subsequently urgent Computed Tomography (CT) scan which showed huge anterior neck collection with enhanced wall and air loculi seen within, extending up to superior vena cava. Later she had bloody aspirate in endotracheal tube, so CT scan of the chest was done which showed that there is aneurysms involving the right pulmonary artery with necrotizing pneumonia involving the right upper lobe and blood culture was positive for Streptococcus viridans and the pus culture was positive for Streptococcus milleri. Discussion and conclusion: Pulmonary Artery Aneurysms (PAAs) are very rare findings in the pediatric population. The impressive size of the distal aneurysms and the occurrence in a pediatric patient are unique features of this case. Most mycotic aneurysms are secondary to endovascular seeding. Successful management of mycotic aneurysm of PA in pediatric patients consists of high clinical suspicion, prompt diagnosis, and initiation of the broad-spectrum antimicrobial therapy which covers all possible causative agents, surgical intervention and coil embolization by interventional radiologist. Mycotic aneurysm, Necrotizing pneumonia, Pulmonary hypertension, Sickle cell disease, Strep melleri, Strep viridans. Mycotic aneurysms of Pulmonary artery (PA) are a rare entity, and furthermore it is very rare in pediatrics. Its association with infection, structural cardiac and vascular anomalies, vasculitis, and pulmonary hypertension has been noted. To our knowledge, this is the first reported case of mycotic aneurysms of pulmonary artery in a child with sickle cell disease (SCD). 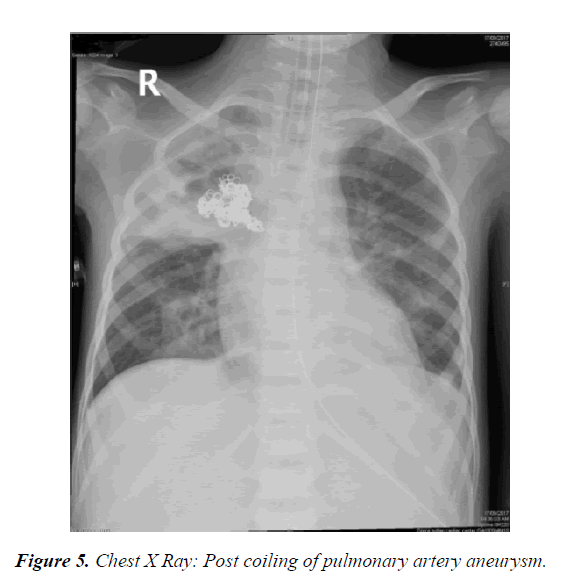 We report a case of 10-year-old girl with SCD, who developed mycotic aneurysms of pulmonary artery secondary to Streptococcus milleri sepsis with necrotizing pneumonia of right lung, and the mycotic aneurysms of pulmonary artery were treated with coiling. 10-year-old girl, known to have SCD was on penicillin V, folic acid and Hydroxyurea. Presented with dental abscess and fever and was treated with IV antibiotics in her local hospital and she also received Packed Red Blood Cell (PRBC) transfusion x 3 times over the course of 10 days in view of low hemoglobin. Later she developed swelling around the neck with difficulty in breathing and swallowing, so she was discharged against medical advice (AMA) from her local hospital and was brought to our hospital Emergency room (ER). Upon presentation to our ER, her hemoglobin (Hb) was 7 gm/dl and hematocrit was 22%, urgent ultrasound neck was done which was suggestive of neck abscess involving the whole of the anterior aspect of the neck and the sides (mainly the right side). Urgent Computed Tomography (CT) scan of the neck and chest was done, which showed huge anterior neck collection with enhanced wall and air loculi seen within, with retrosternal extension and direct extension to the Right upper lung and Right brachiocephalic vein which is thrombosed and extending up to Superior vena cava (SVC) with air loculi inside (Figures 1 and 2). Figure 1. CT Neck and Chest: Huge anterior neck collection with enhanced wall and air loculi seen within, with retrosternal extension and direct extension to the right upper Lung. Figure 2. CT Neck and Chest: Right brachiocephalic vein thrombus, extending up to Superior Vena Cava (SVC) with air loculi inside. Subsequently she underwent surgical drainage of the abscess, and post operatively was on ventilator support and received Low molecular weight (LMW) heparin for the right brachiocephalic vein thrombus. She was commenced on broad spectrum antibiotics to cover gram positive, gram negative and anaerobes. Furthermore, she went on to develop pulmonary infarction of the right lung, echocardiography (ECHO) done initially showed mild left ventricular dilatation with normal function and mildly elevated pulmonary pressure. 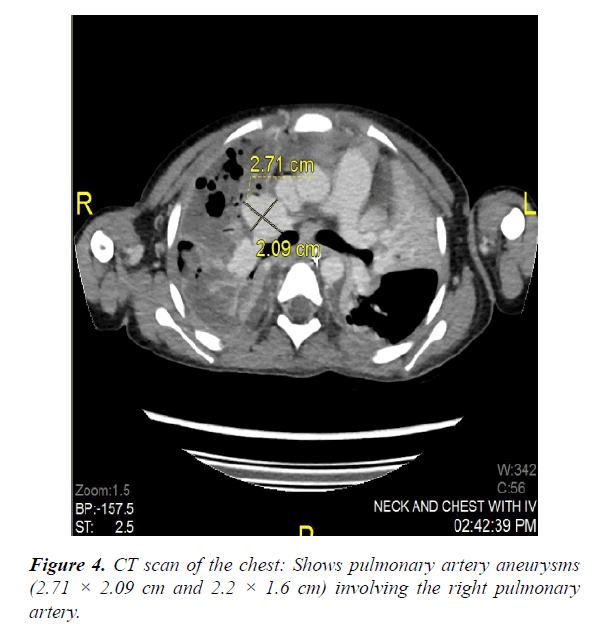 And in view of mild endotracheal tube bleeding repeat CT scan of the chest was done which showed that there is evidence of pulmonary artery aneurysms (2.5 × 2.6 cm and 2.2 × 1.6 cm) involving the right pulmonary artery. So she underwent pulmonary artery coiling by the interventional radiologist without any complications. CT scan of abdomen showed hypo dense lesions in the spleen. The pus culture was positive for Streptococcus milleri and the initial blood culture grew Streptococcus viridans, all repeated cultures were negative (Figures 3-5). Figure 3. CT scan of the chest: Evidence of pulmonary artery aneurysms (2.78 × 2.24 cm and 2.2 × 1.6 cm) involving the right pulmonary artery. Figure 4. CT scan of the chest: Shows pulmonary artery aneurysms (2.71 × 2.09 cm and 2.2 × 1.6 cm) involving the right pulmonary artery. Figure 5. Chest X Ray: Post coiling of pulmonary artery aneurysm. Repeated ECHO showed mild left atrial dilatation, moderate left ventricular dilatation and mild pulmonary hypertension. 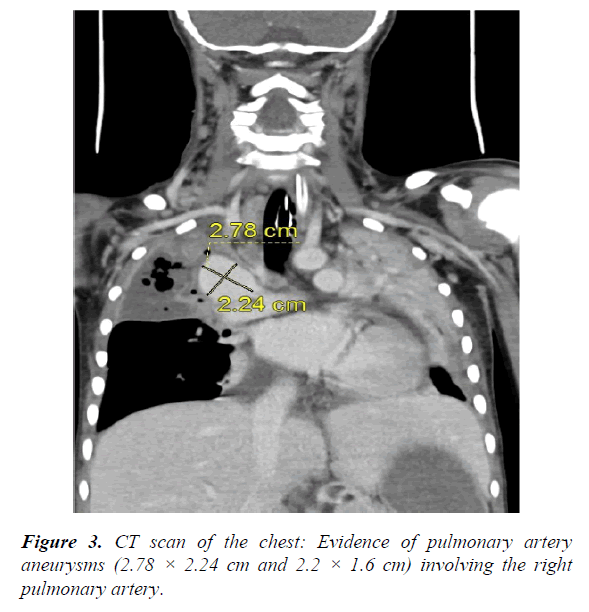 Repeated CT chest/neck with contrast showed significant regression of the previously noted neck abscess, right brachiocephalic vein thrombus has shrunken in size and extent. Previously noted aneurysm of the right pulmonary artery has been coiled with no evidence of other aneurysm. Necrotic lung tissue became more hypo dense with marginal enhancement suggestive of abscess formation in the right upper lobe and lower lobe with residual consolidation in the left lower lobe. Subsequently patient was treated with intravenous (IV) antibiotics for 8 weeks as per the pediatric infectious disease team recommendation, and the right lung abscess and hypo dense lesions in the spleen resolved. And her transcranial doppler (TCD) velocity was high in the Right middle cerebral artery (RMCA) >220 cm/s, and her Magnetic resonance imaging (MRI) of the brain was normal. She was commenced on chronic PRBC transfusion program and was continued on LMW heparin. Furthermore, she developed allo-antibodies (++ +) and it was extremely difficult to find a compatible blood unit, so she was re-commenced on hydroxyurea. Human leukocyte antigen (HLA) typing done for the patient and the family members but unfortunately there was no matched donor. She is currently waiting for Matched Unrelated donor (MUD) Stem Cell Transplant. Development of a pulmonary arterial aneurysm can be caused by infection, congenital cardiovascular anomaly, trauma, pulmonary hypertension, or vasculitis. And among these, infections are the major cause of pulmonary artery aneurysm (PAA) [1,2]. Most commonly encountered organisms causing mycotic PAA are staphylococcus and streptococcus. And rarely mycobacterium, treponemal and fungal (aspergillus, actinomyces, candida species) organisms have been reported . Streptococcus milleri belong to anginosus group streptococcus which are members of the Viridans streptococcus group. They are implicated as etiologic agents in a variety of serious purulent infections. Their unique characteristics is their ability to cause abscesses. PAAs are very rare findings in the pediatric population. Several cases of the large PAA have been reported in the adult population, most often located in the main pulmonary artery. The impressive size of the distal aneurysms and the occurrence in a pediatric patient are unique features of this case . Proximal PAAs involve the pulmonary trunk and the main right and left PAs. The upper normal limit for the diameter of the main PA on CT scan is 29 mm and that of the right interlobar artery is 17 mm [4,5]. Pulmonary artery dimension that exceeds this value is considered enlarged, and one that exceeds 4 cm are considered aneurismal in adults . Most mycotic aneurysms are secondary to endovascular seeding (due to septic pulmonary emboli) and are found in patients with endocarditis, or infection of already existing aneurysm [7-9]. Aneurysms secondary to a direct extension of infection from the adjacent parenchyma are seen in patients with necrotizing pneumonia or chronic tuberculosis . Mycotic aneurysms can be single or multiple and can be located centrally or peripherally. Our review of 21 cases of mycotic aneurysms of the intrapulmonary arteries shows that the majority of these patients had diseases usually associated with pulmonary hypertension, either chronic recurrent thromboembolism or significant left-to-right shunts. Two patients had primary pulmonary hypertension [1,11]. The presence of pulmonary hypertension can only be inferred from the nature of the communication between the systemic and venous system and the presence of right ventricular hypertrophy. Furthermore, pulmonary hypertension is a common complication of sickle cell anemia. And pulmonary angiography is the gold standard in diagnosis [12,13]. Successful management of mycotic aneurysm of PA in pediatric patients consists of high clinical suspicion, prompt diagnosis, and initiation of the broad-spectrum antimicrobial therapy which covers all possible causative agents, surgical intervention for example complete debridement of the infected tissues and coil embolization by interventional Radiologist. PAA is a life-threatening condition, as its most grave symptom is massive hemoptysis. Even in cases where rupture had not occurred, untreated cases had a very high mortality rate . The treatment modality preferred in these cases is coil embolization, since it is the least invasive therapy especially because surgery poses a very high risk for patients with severe pulmonary hypertension . Kim HS, Oh YW, Noh HJ, et al. Mycotic pulmonary artery aneurysm as an unusual complication of thoracic actinomycosis. Korean J Radiol. 2004; 5: 68-71. BartterT, Irwin RS, Nash G. Aneurysms of the pulmonary arteries. Chest. 1988; 94: 1065-107. Toganel R, Benedek T, Benedek I. Giant mycotic pulmonary artery aneurysms in a newborn. European Heart Journal Cardiovascular Imaging. 2014; 15: 885. Fraser RS, Muller NL, Colman N, et al. Pulmonary hypertension and edema. In: Fraser RS, Muller NL, Colman N (eds.,) Diagnosis of diseases of the Chest. Philadelphia, PA: Saunders. 1999; pp:1935-7. Nguyen ET, Silva CI, Seely JM, et al. Pulmonary artery aneurysms and pseudoaneurysms in adults: Findings at CT and radiography. AJR Am J Roentgenol. 2007; 188: W126-W34. Barbour DJ, Roberts WC. Aneurysm of the pulmonary trunk unassociated with intracardiac or great vessel left-to-right shunting. Am J Cardiol. 1987; 59: 192-194. Laohapensang K, Aworn S, Orrapi S, et al. Management of the infected aortoiliac aneurysms. Ann Vasc Dis. 2012; 5: 334-341. Dolapoglu A, Dela-Cruz KI, Coselli JS. Management of a mycotic thoracoabdominal aortic aneurysm involving the celiac artery. Tex Heart Inst J. 2016; 43: 528-530. Lee W, Mossop P, Little A, et al. Infected mycotic aneurysms: Spectrum of imaging appearances and management . Radio Graphics. 2008; 28: 1853-68. Chung CW, Doherty JU, Kotler R, et al. Pulmonary artery aneurysm presenting as a lung mass. Chest. 1995; 108: 1164-66. Frazier AA, Galvin JR, Franks TJ , et al. From the archives of the AFIP: Pulmonary vasculature-hypertension and infarction. Radio Graphic. 2000; 20: 491-524. Bartter T, Irwin RS, Nash G. Aneurysms of the pulmonary arteries. Chest. 1988; 94: 1065-75. Nair KS, Cobanoglu AM. Idiopathic main pulmonary artery aneurysm. Ann Thorac Surg. 2001; 71: 1688-90. Chiang WC, Tsai JC, Chen SY, et al. Mycotic aneurysm caused by Streptococcus constellatus subsp. constellatus. J clin Microbiol. 2004; 42: 1826–28. Ramakrishna G, Sprung J, Ravi BS, et al. Impact of pulmonary hypertension on the outcomes of noncardiac surgery: Predictors of perioperative morbidity and mortality. J Am Coll Cardiol. 2005; 45: 1691-9.